Marie-Emmanuelle Tugler and Marc Witz are riding from Brazil to Peru! 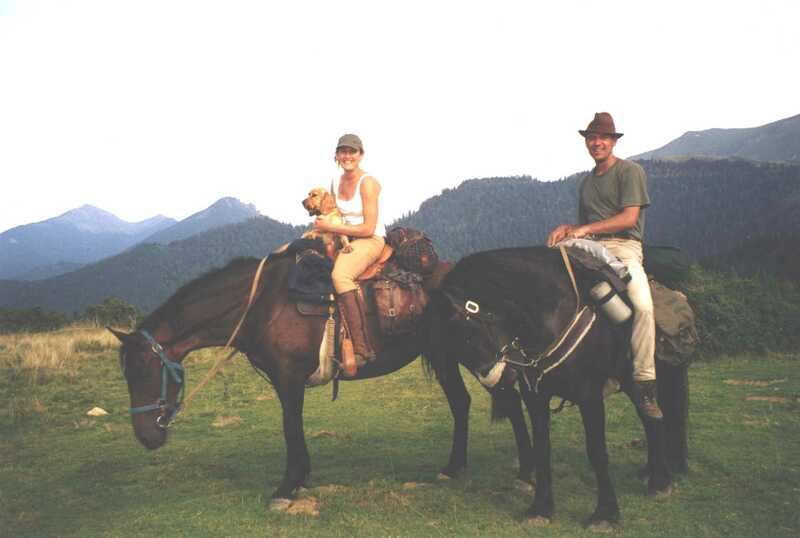 Click on photo to enlarge Marie-Emmanuelle, Marc and their dog Max (the MMMs) are shown on a training ride in the Pyrenees Mountains of Europe. Marie-Emmanuelle (Marie) and Marc are following their dream, which is leading them from the luxuriant sub-tropical forests of Southern Brazil to the mythical Incan ruins of Machu Picchu in faraway Peru. Both are experienced world travelers, having visited a host of exotic climes including Indonesia, Morocco and Japan. However, this is their first long-distance equestrian journey. Marie-Emmanuelle sent The Long Riders' Guild an email in which she summed up their philosophy regarding equestrian travel. "When a person love horses and is a nomad at heart, then horseback travel is the most beautiful, the most authentic, and the most motivating of enterprises." "Our entry into Santa Cruz was peaceful. In spite of the traffic, the horses remained very calm. We went almost to the middle of town, and asked a policeman where the equestrian centre was. We were unlucky – he misdirected us and we wasted three hours, going all around the town and riding right through the market at its busiest time! We were even interviewed by Channel 33, and everyone was taking our photographs because they were all amazed by what we were doing. The Lomita Club welcomed us with open arms. Unfortunately, our horses were condemned to stay tied to some trees until the riding lessons were over, whereupon they were released into the ring. A sad fate for our gentle travelling companions who had just covered 650 kilometres (400 miles) in torrid heat. So we had to hurry to get them shod, take more blood samples, and do a little shopping. Good news – the horses are no longer pyroplasmosis carriers and are therefore among the 30% of horses on which the treatment works. At Lomita, we were not the only equestrian travellers: Alejandro, an Argentinean pilgrim, is also travelling in the direction of Mexico. Unfortunately he had been turned away by Peru because of the quarantine and because of the exorbitant tip demanded at the border. We had to decide whether to go to Cochabamba by the new northern route – flatter, but hot and with heavy traffic – or by the southern route – steeper and more winding, but more picturesque – we moved the horses and left by bus to see the Inca ruins of Samaipata 120 kilometres (75 miles) along the southern route. The place and the road were enchanting, so the decision was easy. At Samaipata we met someone who had crossed the Amazon in a cargo boat. His stories made our mouths water. Instead of spending a month freezing in the Andes up to La Paz and risking being turned back at the Peruvian border, we considered selling the horses at Cochabamba. We would then be able to cross the Altiplano in a bus; which would mean we could see more things, before doing down the Amazon in a boat as far as the North-East coast of Brazil. We were delighted with this idea. Marc would really have liked to defy the Andes on horseback, but I am relieved because I was worried about the cold and the lack of food for the horses. For about 200 kilometres (125 miles), the countryside alongside Amboro Park changed frequently, from semi-tropical forests to fertile plains by way of cactus-filled deserts. About 100 kilometres (62 miles) further on, at Comarapa, we decided to stop for a few days before tackling the “Siberian Sierra” feared for its peaks of over 3,500 meters (10,000 feet) and its humid, cold and foggy climate which hampers visibility. The following day, as we were having breakfast at the communal table in the market, three Bolivians who made a programme about Amboro Park suggested that we accompany them to the Inca ruins 40 kilometres (25 miles) away, while the horses rested. Together with the forest ranger, we penetrated into the savage universe of the park. Before we did anything else, we had to cross the river, which was no easy task. We made a human chain so that nobody would be swept away; the water was right up to our thighs. We entered the thick forest where everything was covered in lichen. We lifted up our eyes – surprise! Over our heads were half a dozen monkey watching us. We were more amazed by the giant trees, the orchids, the wild tomatoes and the magnificent mushrooms than we were by the Inca ruins. That evening we went to give grain and vitamins to the horses but…. they weren’t there! Somebody must have left the door open and they had escaped. We looked for them in vain that night, and it was only the following day that we found them in a freshly-ploughed field. So it was not until 10 o’clock that we attacked the famous Siberia by climbing 15 kilometres (nearly 10 miles) up to the first village. We made slow progress and got off and walked frequently to help the horses. At times we were literally halted by the strength of the gale, which forced us to crouch down and let the horses put their backs to the wind. In the village we were given a choice spot, slightly protected from the wind, to put the horses and to set up our tent, but we had a magnificent view of the majestic peaks of the Andes. Feeling very happy, we crawled under a blanket looking at the panorama and waited for the sunset, which was absolutely splendid. We left under a huge sun and headed for Siberia, the town nestling in the clouds where, they say, it is always cold. Up until midday, everything was fine, but suddenly, as we turned the corner, the coolness of the approaching clouds could be felt. The vegetation was terribly humid and the lichen-encrusted forest seemed to be haunted. Hardly visible in the mist, a herd of loose horses followed us. The mist gradually became a shower. After the hat, the poncho and then the rain trousers had to be taken out and put on. The wind made us so cold that we could not even smile at all the people in the trucks and lorries who waved at us. Early the following morning we emerged from the school house we had stayed in, brilliant sunshine blinded us and lit up the mountains. Yet again the view was magnificent and fascinating! What a privilege to be here, 3,600 metres (11,000 feet) up under such a open sky… We did not suffer noticeably from the altitude. On the contrary, we were very cheerful as we went back down to the valley where the temperature was rather more clement. At 5 a.m. the next day it started raining again. We decided to stay dry in the tent and wait for the shower to pass. In the end we spent the whole day playing chess and resting. The following day, with 4 biscuits in our stomachs, we left under a completely grey sky. We had run out of food for ourselves and for the horses, so we just had to leave! It was very cold on this crested road. Depending on the state of the river, the valleys are either completely dry and desert-like, or fertile and cultivated with ox-drawn ploughs. The little houses blended perfectly into the landscape. At about 10 a.m. Marc went off looking for food. A plump woman with long brown hair, who only spoke Quechua, indicated we should enter her house. She offered us (and the dog) a plate of beautifully hot soup. When we left, her children – who hadn’t dared speak to us – called to us from the top of the mountain. We replied until the last turn of the track when they disappeared from view. This little episode warmed our bodies and our hearts. After visiting the Inkallarta ruins, we carried on through the mountains towards Vacas. Nobody knew exactly how far it was – 20 kilometres? 45 kilometres? But they all told us that it was a good road and not too steep. It wasn’t long, however, before we had to dismount for the sake of the horses. It was a hot, steep climb – the worst we had done! We struggled up to the top, pausing frequently for breath in the rariefied air, getting vertigo when we looked down. After ascending 900 metres (1200 feet) we had a long pause at the summit. The descent was easier, but we now found entire families along the track, coming back from the market with their donkeys fully laden with a week’s worth of goods. They all wore an Awayo, the typical Bolivian brilliantly-coloured shawl in which they carry their baby, their goods, or indeed straw for the animals. It was almost night when we got down into the valley, to find that everyone in the village was drunk, presumably because of the market. It was impossible to find any straw! Chicha, drink based on fermented corn, was causing a lot of problems. We put the tent up in the dark and went in search for something for the horses to eat, as well as ourselves. Chicha, chicha, nothing but chicha! In order not to offend, we ended up accepting one bowl, then two, three, five…. The custom of throwing a little of one’s glass onto the ground in honour of Pachamama – the Earth Mother – was very handy! In the end we managed to escape. Marc went off looking for straw, while I took refuge in the tent. After an hour, a band of drunkards came up. “Wakt up, we want to see your papers!” Without leaving the tent, I suggest we deal with it in the morning – I was afraid I would never get rid of them… Worse, they might steal our passports. After a while they got tired of it and left. Two hours later, Marc descended from the mountain with a meagre pittance for the horses. I had hardly had time to tell him what had happened when the drunks returned. Now they wanted to see our “authority to stay in the community”! They can surely never have met a tourist in their lives…. We stood firm against their threats – and in the end they went away. But Marc saw red when he realised they had taken Tipi! Marc ran after them trying to catch them up, and eventually he crossed the village and found Tipi who was whinnying from a courtyard trying to call his mates. Marc, furious, tore away the blanks which were barring the way, and grabbed his horse while the drunks ran away giggling. We slept with one eye open that night. A few hours later, a loud bang on the tent had us leaping out of bed. Marc rushed outside yelling, “Ven aqui” (come here) but there was nobody there. He found a hole in the double roof of the tent, probably from a stone thrown with a catapult, so we decided to leave…..
Our journey continued without incident until we got to Arani on the Cochabamba plateau. We quickly found somewhere to put the horses, with straw. We were offered a room for the night, so we bought a large bouquet of flowers at the market to thank the woman for her hospitality. I had stomach cramps – was it the water or the prospect of selling the horses? After a week, on 24th December, we found what seemed like good homes for the horses. Tipi and Coco went quietly off to a large ecological farm 30 kilometres away. There they will take tourists for weekend rides. As for Brioza, she is joining a large herd of mules, and twice a month she will carry goods to the nearest village. Sad but reassured, we left our travelling companions. Those companions with whom we have been so happy, so serene, so confiding for 6 months and 3,200 kilometres. Thank you Coco, thank you Tipi, thank you Brioza for this fabulous journey through nature, meeting men, women and children. Thank you for those unique and unforgettable moments, river-crossings by ferry, the sunrises in Pantanal, the long swims we enjoyed. Thank you also for your sure-footedness on dark nights, and for the gallops we had behind the cattle in Brazil…. This is a difficult page to turn. With our saddles under our arms, we got on the bus and set our faces in the direction of Cochabamba. But a new journey is now beginning, on foot, by truck, by bus, by boat…. " Click here to read the MMMs earlier emails. We will update this page as and when we received news from this adventurous couple.